A well-planned and designed outdoor lighting system enhances the beauty of your landscape and makes better use of outdoor spaces like decks and patios. Exterior lighting can offer transition lighting between indoors and outdoors and provide necessary lighting to safely see walkways, steps and doorways. 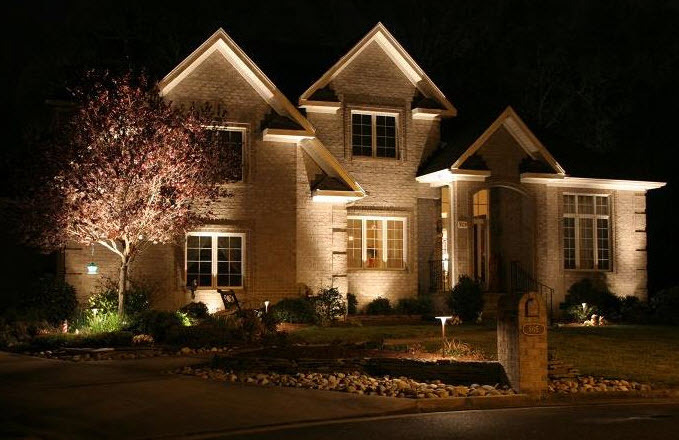 Your guests will feel more welcome and your family will feel safer when your home and yard are properly lit. Door Lighting – Your main entrance is your welcome into the home and can accent your home’s curb appeal. Lighting on both sides of the door should be considered with at least one light provided on the same side as the door handle to minimize shadows on locks. Lighting your main entrance is a must for safety reasons and checking these lights should be part of your monthly maintenance plan. Path Lighting – Path lights are low to the ground to provide lighting for walkways, steps and driveways. When lighting longer paths, position lights on alternate sides of the path for variety and better sight lines. Position step lights to avoid shadows on the steps. For driveways, position the lights to define the edges by placing them a foot from the edge along one or both sides. Up Lighting – Up lights focus attention on specific items like statues, textured walls and trees. Lights can be positioned near tree trunks to emphasize bark texture or away from the tree to dramatize the density of the foliage. In-ground lights can be concealed behind plants and should be aimed away from viewers to avoid glare. Down Lighting – Floodlights can be positioned to illuminate wide areas for safety and outdoor entertaining. Lights can also be placed up in trees to create a moonlight effect and cast ground shadows of branches and leaves. Consider pruning requirements and lamp replacement when positioning these fixtures. Spotlights – Spotlights use an accessory shield to provide a direct beam of light to accent the beauty of specific features around your home. When placed properly, spotlights light up your prized flowers or an ornamental tree with almost no glare. Front Lighting – Front lighting is a common technique that provides lighting to a dimensional area producing well defined shadows. Cross-front lighting can be applied by adding another floodlight to soften the shadows. Front lighting can also be used to project dramatic shadows of plants, trees, rocks, statues, etc. Back Lighting – Another technique for enhancing the drama of distinctive small trees, rocks and plants near the home is to back light them creating a silhouette on the lit wall. Best when lit from below, brick walls and textured surfaces can be enhanced visually and offer a backdrop for your evening landscape. Outdoor lighting ideas and landscaping for an outdoor lakeshore living area are covered in today’s video from the Today’s Home Remodeler TV series. 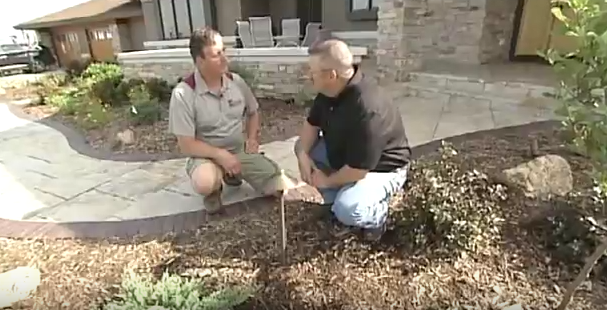 Host Stuart Keith checks out a couple projects with Craig Kittleson and Kirk Zimpel from Kittleson Landscape.